This week's poll by Innovative Research for the Hill Times is the best one yet for the Liberals: a 5-point national lead, and a 12-point ON lead. Given the Conservative poll efficiency and the turnout adjustment, this is the kind of poll that the Liberals need to inch ahead in the projection. Like Léger, Innovative shows a tight NDP/Liberal race in Québec, followed by the Bloc and the Conservatives. 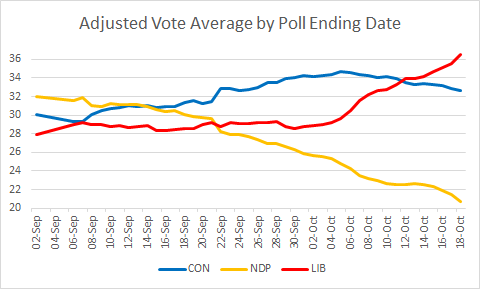 It is also showing a three-way race in BC, where all three parties are now within 0.7% in the unadjusted poll average. Today's EKOS is the first poll in a while containing some bad news for the Liberals: their slight national lead from yesterday has been erased, and their ON lead decreased to 2.2% (from 7.3% yesterday). Of course, at this point, this is not very meaningful - remember that this morning's Nanos had the Liberals increasing its national and ON leads. Note that I've compared the data from MB/SK, including this mega SK poll by Mainstreet, and the two provinces appear to be moving in very similar ways relative to 2011. 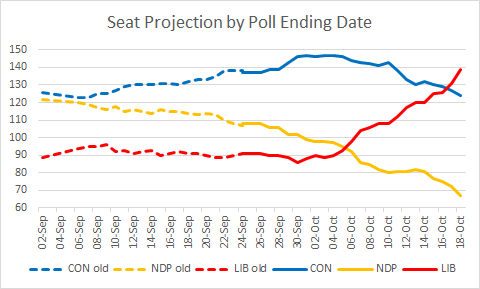 (There is some very slight evidence that the Liberals are doing a bit better and the NDP a bit worse than expected in MB, with the opposite being true in SK, but we're talking 1-2 points, which could be just noise.) Thus no adjustment is needed there. In a few hours, I will post the trends for this week. But you already know what's coming: there has been a Liberal surge! 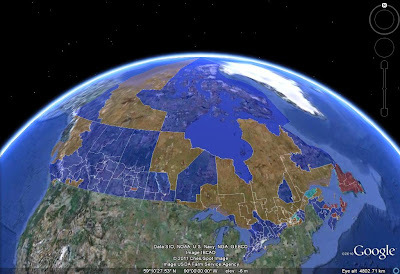 I'll also look at the situation in each region.